The year has started with Dollar’s strengthening. The pair GBP/USD went down after the release of negative stats from UK. PMI Manufacturing dropped down to the level of 57.3 point last week, and the pair has lost 200 points since. Today UK PMI Services will be published as well as US Non-Manufacturing PMI. If Britain index stays true to the positive forecasts, the pair GBP/USD will be corrected upwards, otherwise, Bearish movement will go on. In mid-term scenario we expect the trend to reverse to the descending one. The assumption is justified by several factors. First of all, US economy showed great growth in 4th quarter of 2013. Secondly, demand of US Dollar is growing, because the Pound is overbought. At last, negative macroeconomic data from UK affect British currency. The pair is going to reach support at the 50% Fibonacci retracement (1.5750). Additional support levels are 1.6320, 1.6200, 1.6100 and 1.5860. Resistance levels will be at 1.6450, 1.6540, 1.6600 and 1.6740. 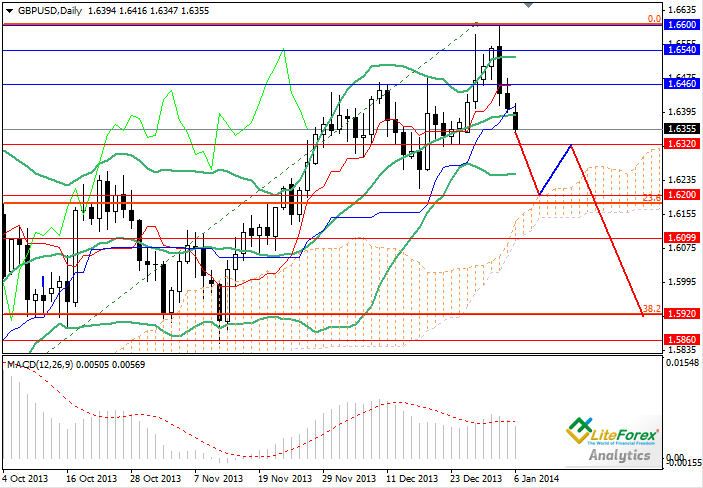 Short positions can be opened at current price with targets around 1.6000-1.5860. Pending sell orders should be placed at 1.6450 with take-profits at 1.6100.